Tartarus - The lowest region of the underworld. Hesiod claimed that a brazen anvil would take nine days and nights to fall from heaven to earth, and nine days and nights to fall from earth to Tartarus. Tartarus rose out of Chaos and was the destination of wicked souls. 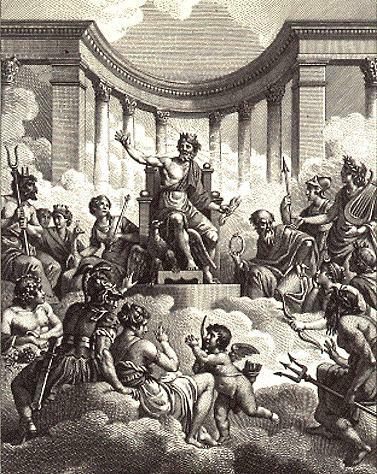 Uranus banished his children the Cyclopes and the Hecatoncheires to Tartarus, as Zeus also did to the Titans. Other famous inhabitants of Tartarus inc lude Sisyphus, Ixion, Tantalus, Salmoneus, Tityus, Ophion, and the daughters of Danaus. Erebus - Personification of the darkness of the Underworld and the offspring of Chaos. . In later myth, Erebus was the dark region beneath the earth through which the shades must pass to the realm of Hades below. He is often used metaphorically for Hades itself. Uranus + Gaea - The personification of the sky; the god of the heavens and husband of Gaea, the goddess of the earth. . Their children are the Hecatonchires, the Cyclopes and the Titans. Cyclopes - Three sons: Arges, Brontes, and Steropes of Uranus and Gaea. The Cyclops were giant beings with a single, round eye in the middle of their foreheads.They helped Zeus defeat their brother, Cronus, by forging lightning bolts. They also made Poseidon’s trident and Hades invisibility cap. Cronus + Rhea - Cronus was a ruler of the universe during the Golden Age. He was one of the 12 Titans and the youngest son of Uranus and Gaea, Cronus and his sister-queen, Rhea, became the parents of 6 of the 12 gods and goddesses known as the Olympians. Cronus had been warned that he would be overthrown by one of his own children. To prevent this, he swallowed his first five children as soon as they were born. Rhea did not like this. She substituted a stone wrapped in swaddling clothes for their sixth child, Zeus. He was hidden in Crete, and when he was older, he returned and forced Cronos to disgorge all the other children, who had grown inside of him. Zeus and his siblings fought a war against Cronos and the Titans. Zeus won, and the Titans were confined in Tartarus, a cave in the deepest part of the underworld. Oceanus + Tethys - The personification of the vast ocean. Together with his wife Tethys, they produced the rivers and six thousand offsprings called the Oceanids. He ruled over Ocean, a great river encircling the earth, which was believed to be a flat circle. The nymphs of this great river, the Oceanids, were their daughters, and the gods of all the streams on earth were their sons. Zeus + Hera - The god of the sky and ruler of the gods of Mount Olympus. He displaced his father and assumed the leadership of the gods of Olympus. Zeus was considered the father of the gods and of mortals. He did not create either gods or mortals; he was their father in the sense of being the protector and ruler both of the Olympian family and of the human race. His weapon was a thunderbolt. His breastplate was the aegis, his bird the eagle, his tree the oak. He was married to Hera but, is famous for his many affairs, which resulted in many known children and probably many more that were not known to be his. Athena was his favorite child. He bore her alone from his head. One of the greatest feasts for Zeus was the Olympic games. They were taking place every four years in Olympia. Even if there was a war between the city-states of Greece they were stopping the war to take part on that games. Demeter + Zeus - Goddess of corn and the harvest. She taught mankind the art of sowing and ploughing so they could end their nomadic existence. She was of a severe, a beauty scarcely relieved by her hair. which was as fair as ripened grain. Poseidon coveted her, but Demeter refused herself to him. To escape him she fled to Arkadia where, assuming the shape of a mare, she mingled with the herds of King Oncus. Poseidon, however, succeeded in finding her, changed himself into a stallion and made her the mother of the horse Arion. Leto + Zeus - The mother of Artemis, goddess of the bow and of hunting. She was loved by the god Zeus, who, fearing the jealousy of his wife, Hera, banished Leto when she was about to bear his child. All countries and islands were also afraid of Hera's wrath and refused the desperate Leto a home where her child could be born. Finally, in her wanderings, she set foot on a small island floating in the Aegean Sea, which was called Delos. Maia + Zeus - Maia was a daughter of Atlas. She was one of Zeus' lovers. She, along with Zeus was the mother of Hermes.